Sam Houston State University has received a federal grant from the National Institute of Justice to create a test for bath salts for toxicological samples in crime labs. Bath salts, also known as synthetic cathinones, are a new breed of designer drugs that were legally sold in convenience stores, head shops and on the Internet until being included on the list of illegal substances through an emergency order by the Drug Enforcement Administration in October 2011. These drugs, that are capable of producing powerful hallucinogenic and adrenergic effects, are routinely seized in drug cases around the Houston metropolitan area and throughout the nation. “Bath salts are the new breed of designer amphetamines, and they pose a number of challenges for law enforcement agencies from a public safety and public health standpoint,” said Sarah Kerrigan, director for SHSU’s forensic science department. While bath salts are easy to detect in seized samples, such as pills, powders and capsules, once they are ingested they pose a number of challenges in the toxicology lab. SHSU’s department of forensic science will develop a procedure to detect at least eight of the most common components found in bath salts in biological evidence. These components include mephedrone, flephedrone, methylone , butylone, ethylone, methedrone, MDPV and naphyrone. Many toxicology labs use gas chromatography-mass spectrometry (GC/MS) to identify drugs in biological evidence. The new study will target a wide variety of the new designer drugs using one procedure, Kerrigan said. According to the Drug Enforcement Administration, bath salts also have adverse effects including rapid heart rates which may lead to heart attacks and strokes, chest pains, nosebleeds, sweating, nausea, and vomiting. Those who abuse the substance also report agitation, insomnia, irritability, dizziness, depression, paranoia, delusions, suicidal thoughts, seizures and panic attacks. 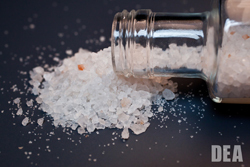 Drug users are attracted to bath salts because they can evade most drug tests and, as a result, it may not be detected in impaired driving cases or death investigations, according to a 2011 report from the National Drug Intelligence Center. “Analytical limitations for state and local forensic toxicology laboratories impact criminal and death investigation casework, and these deficiencies can have serious criminal justice consequences,” Kerrigan said. As part of an earlier NIJ-funded study, Kerrigan recently completed and published research on a related class of designer amphetamines with students and graduates from the Master of Science program in forensic science. Two articles on the detection of similar drugs were published in the Journal of Analytical Toxicology last year. One study identified procedures that could be used to detect the drug in urine samples, and the second concluded that crime labs that use commercial immunoassay testing may fail to detect these drugs. Additional publications are pending. 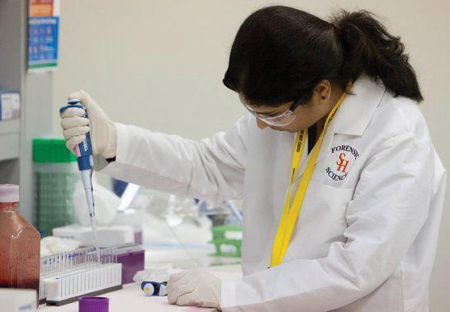 As a former state laboratory director, Kerrigan believes that the collaborative research and close academic-industrial partnerships that exist in the forensic science department are a critical component of the program’s success.